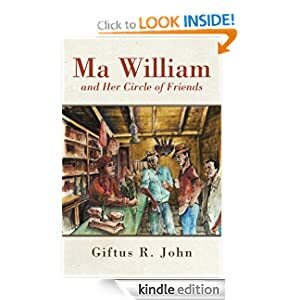 During the past twelve months I have been promoting my latest book, “Ma William and Her Circle of Friends”—a story of a shopkeeper and her gang of “trusted” friends set in my home village of St. Joseph on the island of Dominica. As a “Jack of all”— writer, publisher, promoter, artist, editor, salesman—whatever role was needed, I found myself playing it. I had to find ways to bring the story of this woman and her friends to the bookshelves, Nooks, Kindles and libraries of readers wherever Ma William was available. It has been a challenge doing all this, while at the same time working a full-time job and taking care of some health issues. However, I’d be telling a lie if I said that the journey has not been worth it. Yes, there were many rough times, but also some very rewarding ones. The support and approval of my work outweighed or outnumbered the objections. I have had the opportunity to work with a wonderful person, Eunice Nisbett of Savvy BestSellers, who offered tremendous support and with whose assistance I was able to embark on my first Virtual Book Tour from May 13th – 18th. We were also able to create and launch this blog site. Eunice has been instrumental in getting my work promoted on caribdirect.com affording me the exposure needed to promote my book regionally. We have been continually working on finding new avenues and better ways to promote my work; and lay the groundwork for new projects. I have also had the opportunity to participate in a few events and meet with other writers/authors: the Yonkers Book Festival, the Yonkers Riverfest, and the Collingswood Book Festival; as well as at the DARDA Independence Day Celebrations and the Know Your Culture Independence Gala. The experience has been well worth it. I joined the Dominica Poetic Circle – a Facebook group, and have used the opportunity to network and continue the promotion, not only of ‘Ma William and Her Circle of Friends,” but also of my other books, my photography and paintings, and to share my work with other members of the group. I also created and designed my own book-trailer which has been posted to YouTube. There have been a few disappointments along the way—a sense of what I think is the lack of support for local authors and maybe I can generalize here—for local artists. My belief is that too often our work is treated as second class. I don’t know if it is the fault of the artists or our general attitude that something by someone else is always better. However, the support that is forthcoming from those who appreciate what we do, blunts the effects of the rejection and negativity. In essence, the passion for your craft is the driving force behind it all. A friend recently forwarded me a link. The article that was attached to that link dealt with Playin’ Mas by blogger “Akers” and one of the chapters in “Ma William and Her Circle of Friends” was a source of what was referenced for her article. Behind The Mask: Playin’ Mas. I felt good that my work was used by someone to talk about something that all of us in Dominica, and some other countries in the Caribbean, are familiar with—Playin’ Mas. Ma William has been about life, as I saw it then and as the people of St. Joseph lived it then. Christmas is a few days away and I can see the activity going on in Ma William’s shop. I can hear Ma William and Ma Simbert discussing what they would be doing for Christmas. Paul, bringing some yams for Ma William to sell for him in the shop; Bamboo, trying to get a few little odd jobs to have some money in his pocket; Pappy, doing his best to stay as the “big boy” in the group and, not the least among them, Mr. Jones having to tell everyone if he had received “greenbacks” from his children in the US. They would all be talking of what they would do after midnight mass. As “nennen,” Ma William would be getting her little packages ready to give to the many god-children who would be stopping by during the season. Yes, that was it back then! So as I wind down 2012, it’s time to look ahead to new projects. Yes, I’ll continue promoting “Ma William and her Circle of Friends,” “Mesye Kwik! Kwak!” and “The Island Man Sings His Song,” but there is more that I’d like to share. What is it? We’ll see, if the Almighty grants me the opportunity. Some readers have asked about a sequel to Ma William…very interesting I find and an unexpected request, I may add. Others have asked me when I plan to publish the next book. I won’t commit to anything yet, but hopefully that won’t be too long from now. In the interim let me say thanks for the support and encouragement of so many of you out there. I sincerely appreciate it. Special thanks to caribdirect.com and thedominican.net for continuing to feature my writing. To those of you who have not yet bought your copy, here’s your opportunity to get one as a gift for someone or for yourself, this Christmas. I assure you it will be a wonderful gift that you, or that special someone, will cherish for a very long time. All the best and a Blessed and Merry Christmas to You and Your Families.